With the continued emphasis on the importance of foliage in our gardens, the wide and exciting range of coleus varieties available to the gardening public should augment the planting palette nicely. Chosen as the annual for the National Garden Bureau’s 2015 program, coleus is a durable plant with very significant gardening potential for a wide range of gardeners and their garden situations. Coleus has a long history of use in our gardens as a foliage plant and has gone through various phases of popularity over the past couple of centuries. The relative ease of establishment after planting combined with a wide range of selections has made coleus indispensable in the garden and popular in the container as well. Coleus is thought to originate in Southeast Asia. While there is some debate as to when it arrived in Europe, Dutch botanist, Karl Ludwig Blume, is credited with naming and introducing the plant in mid 19th century England. This member of the mint family, with the traditional square stems and opposite leaves, comes in a wide range of foliage coloration, leaf texture and plant form. Considered an herbaceous perennial in its native range, coleus are used primarily as annuals by a wide range of the gardening public. ?Previously grouped into different species or classified as hybrids, coleus (formerly Coleus blumei and Coleus hybridus) were all placed under Solenostemon scutellarioides in 2006. As of 2012, taxonomic authorities consider the correct name for the coleus to be Plectranthus scutellariodes. ? Victorian gardeners utilized coleus in vivid bedding designs, also called “carpet gardening.” These elaborate patterns were frequently designed to be viewed from above and coleus were a common component in these planting schemes. 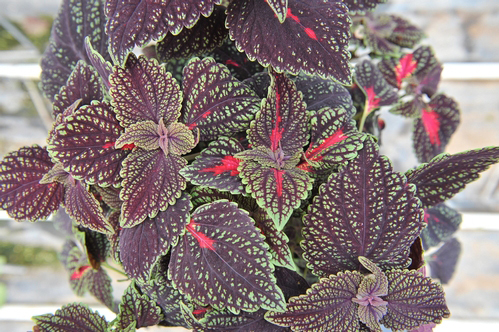 New introductions generated excitement during this period of history and “coleus fever” was rampant for a time. Because coleus mutate frequently, sports and reversions were not uncommon and could result in a new variety of interest. Sports are seen as naturally occurring genetic mutations while reversions represent the appearance of the plant at some point in its “genetic past.” Coleus popularity seemed to dwindle in the early 20th century and didn’t see much of a resurgence of use until the mid 20th century when uniform, seed grown varieties became more popular and coleus also found some popularity as a houseplant. In the 1980s, as more gardeners realized the full potential of this spectacular plant, the coleus boom was reinitiated and the past two decades have seen an amazing number of introductions in both seed and vegetative offerings. 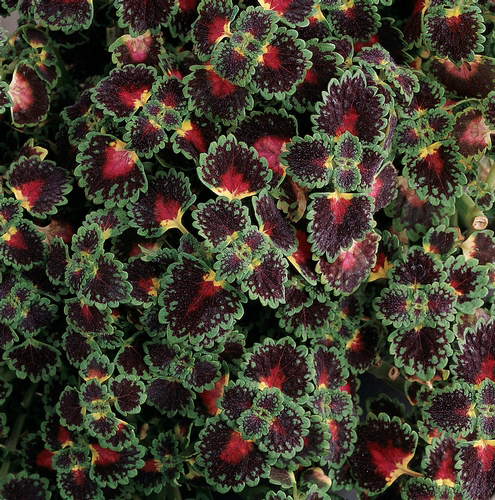 Many of the best selections have been preserved by coleus collectors and enthusiasts over the years, but there is no shortage of new varieties being selected and promoted each year. The primary ornamental feature of coleus is the foliage, which can be represented by green, pink, yellow, orange, red, dark maroon (near black), brown, cream and white. The range of shades for these colors and the possible combinations is seemingly limitless. This plethora of colors and combinations lends itself to the other common names for coleus of painted nettle or flame nettle. While some gardeners will leave the small flowers, it’s recommended that you pinch these off and back to a leaf node to encourage more energy into stem and foliage growth and not flowering. Coleus left to flower may lose vigor as the plant puts energy into seed production. The variability in patterns, some subtle and some more dramatic, is truly amazing. While some selections will exhibit a solid color, other varieties may feature splashes, blotches, streaks, flecks, margins and veins. Color intensity may be affected by sunlight, heat sensitivity and other conditions. Bright sunlight can create a saturation of color and the difference in appearance for most varieties in part shade versus full sun is noticeable. The term “sun coleus” refers to selections that have been observed to tolerate more direct sunlight although moisture considerations become even more important in those locations. Darker cultivars tend to tolerate more sun with the lighter varieties benefitting from some degree of shade to minimize leaf scorching. Morning sun and dappled afternoon shade tends to maintain consistent foliage coloration. The underside of the leaf may also feature an alternate color that can be a contributing factor visually as well. Optimum growing conditions are covered later in this article but consider that too little light will encourage a weak-stemmed, less vigorous plant without optimal coloration. Leaf texture for coleus can be quite variable with foliage that may include the features of being large, small, twisted, elongated, scalloped, lobed, finger-like, “duck’s foot” (webbed feet), etc. 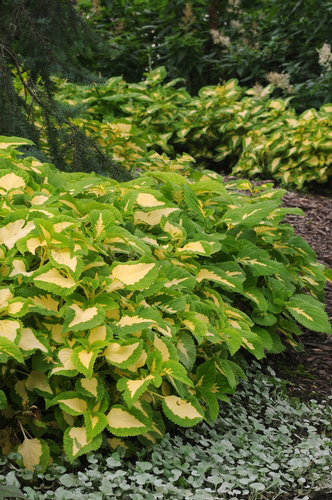 This overall foliage shape, affected by these other features, can be quite ornamental and add to the effect of the plant in combination with the coloration. Leaf texture for coleus should be a serious consideration when selecting and using coleus, as the visual contribution is significant. 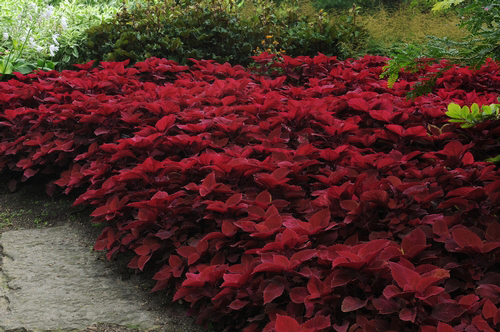 The wide range of coleus can be grouped into three basic plant forms including upright, rounded and prostrate/trailing. Frequent snipping, pinching and trimming can help modify form although mature size will also vary depending on growing conditions and other factors. The trailing forms may also be considered semi-trailing and have value at the edge of container or in a hanging basket. Trailing forms may also be effective as weaving groundcovers and will become a colorful, “living mulch” that not only adds interest but helps shade the soil for moisture retention and discourage weeds. to see a database of some of the more commonly grown varieties. While this list is not comprehensive, NGB Members are an excellent source for information regarding current coleus breeding efforts and currently available varieties. Coleus has long been considered a shade plant but, as was mentioned earlier, they thrive in part shade and dappled shade and will languish in deep shade. In fact, their best leaf coloration is achieved with morning sun and some degree of afternoon shade. Many varieties do well in both shade and part sun, such as the ColorBlaze, Fairway, Superfine Rainbow, Main Street and Kong series. Some varieties can take quite a bit of sun and are quite adaptable as long as they are not allowed to dry out. The color change can also be affected by temperature, available sunlight, soil fertility, etc. Coleus are quite tolerant of a wide range of soil conditions and will do well in even average conditions. Coleus enjoy the heat and languish below 55 degrees F. Cold, overly damp soils can result in leaf drop and may encourage disease problems. However, extreme temperatures over 95 degrees F are also undesirable. Plant coleus after any danger of frost has passed when soil temperatures have warmed sufficiently and evening temperatures are above 60 degrees F. Avoiding too wet or too dry conditions is warranted and coleus are quite pH tolerant except for the extremes of a significantly low (or high) pH. Light fertilization is recommended, particularly in containers. To maintain plant form, pinch back most varieties every few weeks to prevent flower formation. This directs the plant to put energy into additional branching and foliage creation instead of flowering, thereby creating a fuller plant. When pinching off flowers, do so throughout the entire summer to create a full, lush plant. Pinch just above a set of leaves or branching junction for the best appearance (don’t leave a stub!). 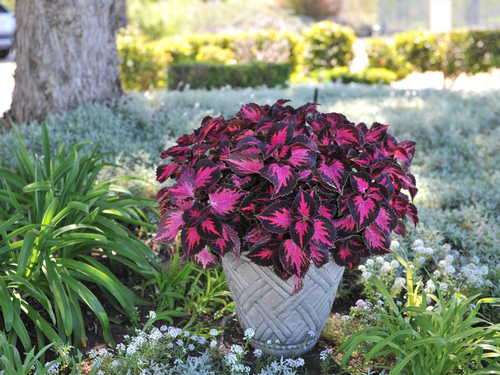 All coleus selections have excellent container potential if they are given an adequate volume of well-draining soil mix, reasonable nutrients and the proper sun exposure to thrive. Avoid windy locations as coleus can be prone to breakage in extreme winds. Slow release fertilizers with a balanced mix of nutrients are recommended for your containers although half strength liquid fertilizer applied every 2 weeks over the growing season should be sufficient. Coleus do not show their best coloration if over fertilized so be conservative and consistent. You may want to consider water retention additives to help alleviate some watering needs, particularly in sunny locations. Keep in mind that poor garden soils might necessitate an elevated container or raised bed to provide sufficient conditions for coleus to not just survive, but thrive! 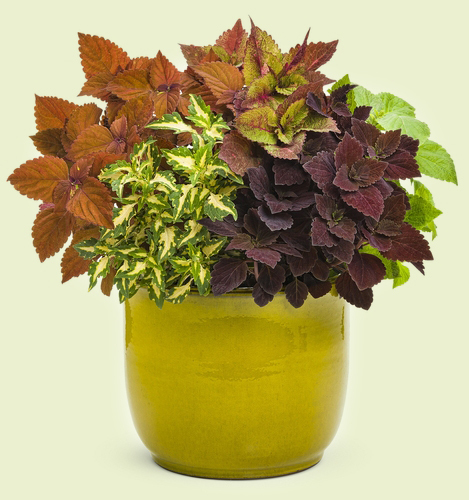 Container size is a factor, as the volume of soil should accommodate substantial rooting by coleus and any other plants that are involved in the design. Drainage is vital so consider adding additional drainage holes as needed. The container style, color and ultimate placement should also be considered in advance. 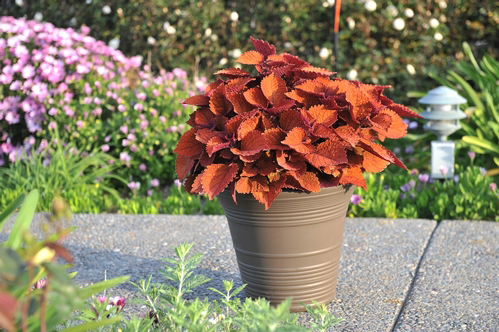 Coleus filled containers, if moveable, allow for instant color as they can be positioned as needed and used to add color, provide immediate interest and accent areas of the garden, deck or patio. As mentioned previously, coleus may become stressed by lack of heat and are certainly affected by available moisture. Excessive or inadequate moisture availability, while affecting vigor and appearance, may also lead to other challenges with insects or diseases. A healthy coleus plant is the best defense against these challenges. Slugs, snails, spider mites, mealybugs, whiteflies and occasionally aphids may be challenges under certain conditions. Positive identification of these pests is the first step in proper selection of a treatment program. Consider additional consultation with experts, your local Extension program or other resources when deciding upon a course of action. While there are few fungi, bacteria, and viruses that affect coleus, there may be occasional issues of stem rot, root rot, or downy mildew, which all have a direct relationship to moisture inputs and associated growing conditions. Relocating the plant, pinching healthy cuttings for re-establishment or removing the plant might be options to consider after appropriate research and consultation. Healthy, young plants will frequently outgrow some of these challenges if properly “encouraged” or may never exhibit problems because of their vigor. The National Garden Bureau recognizes and thanks Mark Dwyer of Rotary Botanical Gardens as author of this fact sheet.